Donations - God's Feeding Hands "Mission Center"
"When you meet suffering souls who need help, give it to them. When you find those who are hungry, feed them. In doing this you will be working in lines of Christ's ministry. 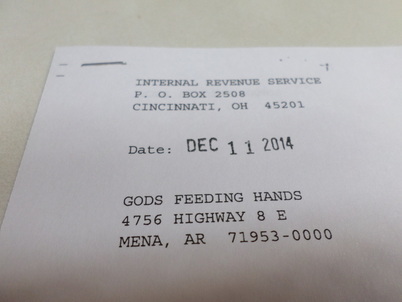 If the Holy Spirit is tugging on your heart to support God's Feeding Hands [501(c)(3)] with a tax deductable donation, then please click on the on the donate button below, or you can send your check or money order to God's Feeding Hands, 1200 Reeves Avenue, Mena, AR 71953. Your precious gift will enable this ministry to continue our work of feeding the hungry! If you live in Mena, Polk County, or surrounding counties, and you want to donate canned goods or non-perishable food to God's Feeding Hands Food Pantry we would greatly appreciate all that you bring! We are located at 1200 Reeves Avenue, Mena, Arkansas 71953! A special thank you to all of these precious people who have stepped out in faith in support of God's Feeding Hands! Their awesome gift will enable us to reach and feed the hungry for God! May we all be about our FATHERS business!